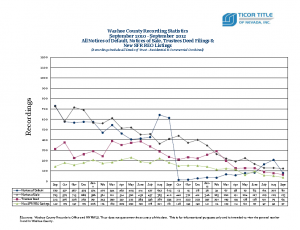 Ticor Title Company published the September foreclosure stats for Washoe County. Notice of defaults, notice of sales, trustee sale purchases, and new REO listings were down from last month. Only 37 REOs were put on the market in September which is pretty worrisome for buyers as it the lowest total in 2 years and will do nothing but make the inventory problem worse. If you’re a seller it’s a good thing because there is less low priced competition. The graph can be viewed by clicking on the picture to the right or link below. For more information on buying or selling a home contact Ricky at (775) 750-1437. Posted in For Buyers, For Sellers, Market Update and tagged real estate agent blog reno, reno broker ricky beach, reno foreclosure homes inventory, reno REO listing information, reno trustee sale homes.